At Launceston Distillery we produce hand-crafted, small-batch whisky. Using traditional techniques and craftsmanship, Tasmanian malted barley and pure river water are combined to produce the finest quality single malt whisky. From grain to bottle everything happens under the roof of Hangar 17. 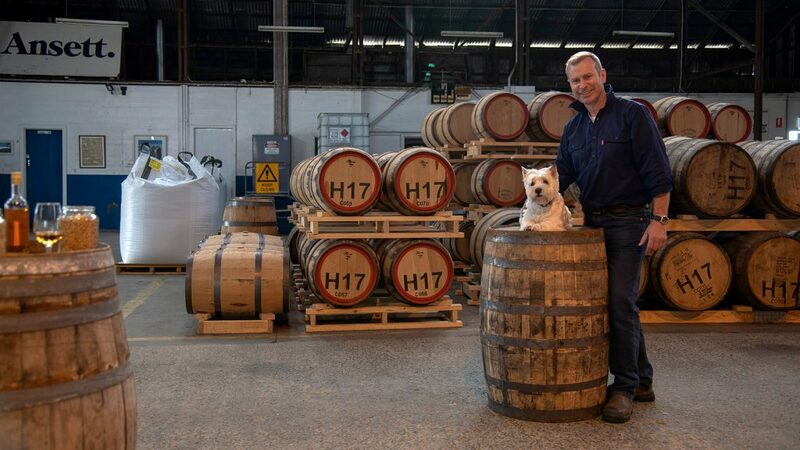 Meet the guardian of Launceston Distillery, our head distiller Chris Condon and his trusty companion Angus. With a background in the pharmaceutical industry as a quality analyst, Chris crafts his whisky with a fine attention to detail. He developed his love of brewing and distilling as a brewing team leader at Boags Brewery, before becoming the founding distiller at Nant Distillery from 2008 to 2011. 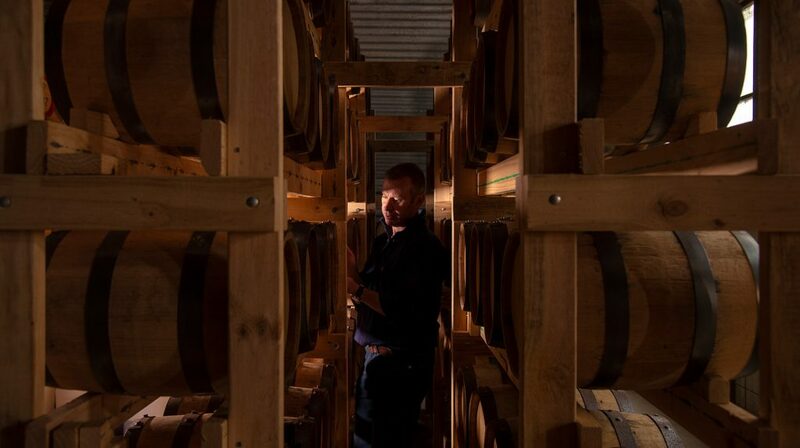 Chris and a dedicated team of friends then founded Launceston Distillery in his home town. With Angus ensuring he follows the heritage, tradition and technique of the finest Scottish single malt whisky, Chris is proud to be the face of Launceston Distillery’s whisky making future. Tasmania’s world-renowned clean air, rich soils and pure rainfall help produce exceptional ingredients for making whisky. 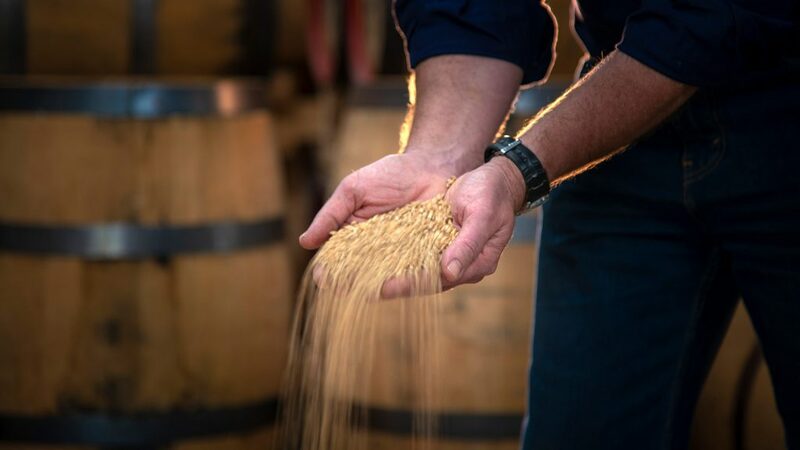 The quality of locally grown barley is a key factor behind the success of Tasmanian whisky. Our distillery is located in the heart of northern Tasmania, surrounded by prime land for growing barley. 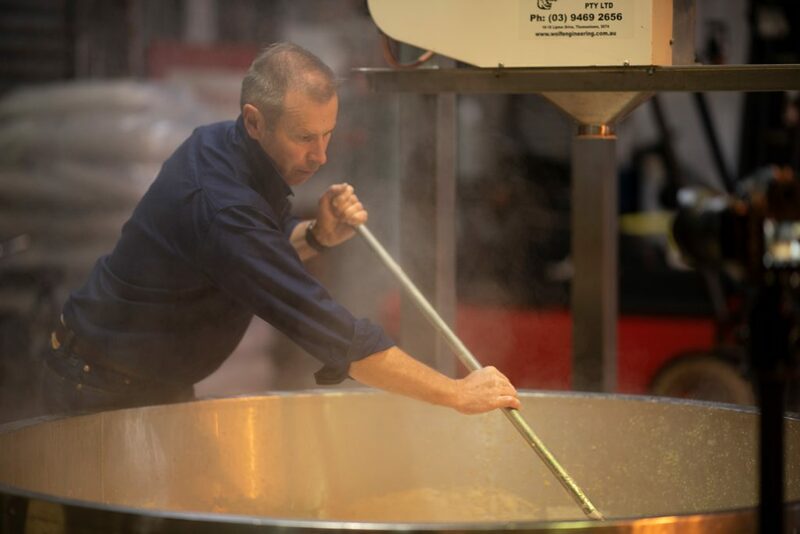 At Launceston Distillery we combine Tasmanian malted barley with pure water from Tasmania’s longest river, the South Esk to produce our premium single malt whisky. Launceston has a proud history of brewing premium beer. The design of our brewing equipment was inspired by the iconic old brew house at J. Boag and Son. Malt whisky begins life in a similar manner to beer. Malted barley is milled to form “grist”, which is mixed with hot water in the mash tun to release sugars and produce a sweet barley water called “wort”. After the wort is drawn off, the spent grain is shovelled out and provides a nourishing treat to farm animals. Wort is cooled and pumped to a fermenting tank where yeast is added. Fermentation lasts for 7 days. During this time the yeast converts sugar into alcohol, transforming the “wort” to “whisky wash” with an alcohol strength of 7%. The yeast formulation and long fermentation time allows complex floral and fruity flavours to develop in the wash.
Our attractive, Tasmanian made copper stills, with their distinctive ‘reflux-ball’ design and Tas Oak cladding, are the centrepiece of the Distillery. Our process is based on a traditional double distillation technique. 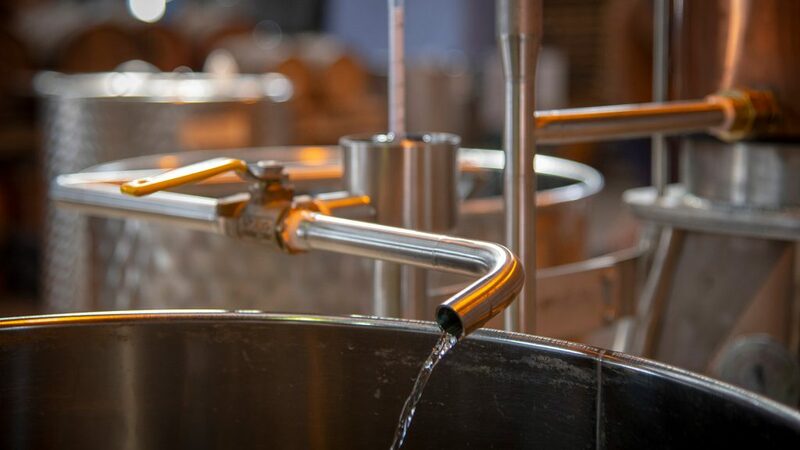 The wash still and spirit still are used in tandem, separating alcohols and other flavour compounds from the wash to produce new make spirit at 63.4%. Gentle heat is applied at crucial times to ensure the vapour enjoys plenty of copper contact. This promotes a lighter, fragrant spirit that compliments the silky oiliness smaller stills typically provide. Both stills are carefully monitored during a run, especially the spirit still where the “cuts” to collect the heart are crucial. 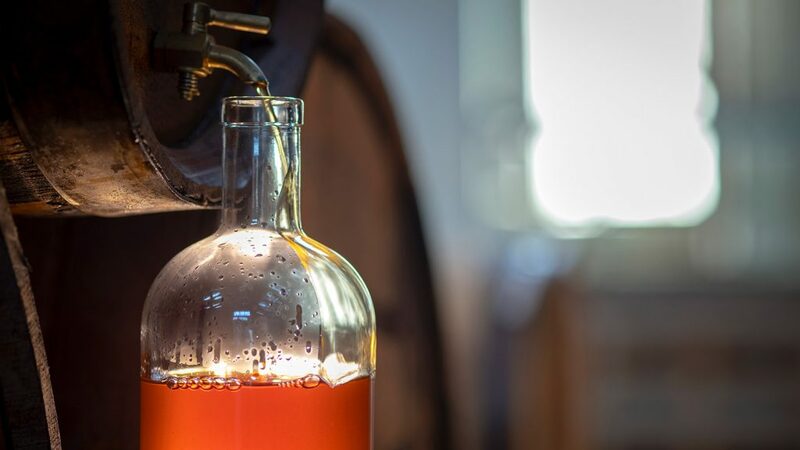 The skill of our distillers ensures that new make spirit is consistent, clean and fragrant. Our whisky is matured in a variety of European and American oak casks, that have previously been used to mature bourbon, Apera (Australian style sherry) and Tawny (Australian style port). These carefully selected oak casks are made for us by some of Australia’s best Coopers. Time in the cask allows the new make spirit to mature into whisky, deriving colour and much of its character from the oak. Flavours vary depending on oak species and cask history. Although whisky matures faster in smaller casks, maturation cannot be rushed. There is no substitute for time in oak to add rich colour, complexity and depth of character. All our casks are aged in our bond store at Hangar 17. When we are confident that the whisky is mature, casks are emptied and prepared for bottling. Some whiskies are bottled at cask strength (about 60% abv), but most are reduced to bottle strength with pure water (around 46% abv). Our whisky is non-chill filtered to retain its depth of character. Our whisky is not artificially coloured in any way, allowing the natural colour derived from the oak to shine through.